As I reported they would in June, the Bulldogs debuted brand new black uniforms this weekend vs Kentucky. The jersey was the one that was leaked in June, with shoulder numbers thankfully added. It was paired with the matte maroon helmet that was previously worn in the Auburn and Texas A&M games. The pants were black, with an over-sized silver M-State logo. The silver numbers, maroon stripes, and matte helmets combined to make this look much better than the previous all-black uniforms, which had a shiny texture and nearly illegible maroon numbers. The pants are outlandish, but more appropriate for a one-off alternate than full time use (like this year's maroon and white pants). As has been the case for the past two years, the Bulldogs will wear all-maroon for homecoming. This will be the second time that this year's maroon pants, which feature an oversized M-State logo, have been worn, with the first being two weeks ago at Texas A&M. This will be the sixth combo worn in 7 games for the Bulldogs. What was expected to be a fairly uneventful game uniform-wise for the Bulldogs ended up containing several upgrades to the Bulldogs' home look. As expected, the shoulder numbers were re-added to the maroon jerseys, as they were the white jerseys two weeks ago. In addition, the silver outline was removed from the helmet logo, which drastically improves its look; the immediate silver outline just muddles things up. Most noticeably, however, was the reintroduction of gray pants. 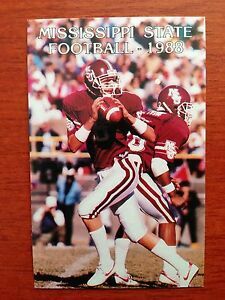 Completely unexpected, the Bulldogs came out in gray pants with a triple maroon-white-maroon stripe, exactly like those worn in the late 80s and early 90s. The only difference is the small M-State logo on the left hip, which is not nearly as overbearing as this year's normal pants logo. This is the first time that the Bulldogs have worn gray pants since the Gator Bowl at the end of the 2012 season, and the first time at home (and with maroon jerseys) since a game ﻿vs South Alabama﻿ in 2012. Due to the lack of the over-sized pants logo, addition of shoulder numbers, and removal of the helmet logo outline, I feel compelled to call this the best home combo of year for the Bulldogs. That being said, there is room for improvement. First, the idea of wears 80s pants with 90s jerseys (and not to mention a modern helmet logo) is kinda odd. This basically brings to light my primary problem with the "DWS 100" uniforms: the lack of color consistency. In this look, the helmet is maroon and white, the jersey is maroon, white, and black, and the pants are maroon, white, and gray. If the Bulldogs want to claim they have a top-tier uniform, they need to make a few small tweaks and even out these inconsistencies. Five weeks into the season, the Bulldogs have finally debuted the maroon pants, which were first leaked over the summer when they were worn in a scrimmage. This will create the third different road combo for the Bulldogs in as many games; they wore the shiny helmet with all-white at Southern Miss and the matte helmet with all-white at Auburn. This week, they are pairing the maroon pants with the matte helmet. From a certain angle, this might be my favorite combo all year for the Bulldogs. I've always been a fan of matte-white-maroon, and from the right side, this is no different. From the left side, however, the large m-state logo can be seen. The oversized logo really detracts from an otherwise sound look.